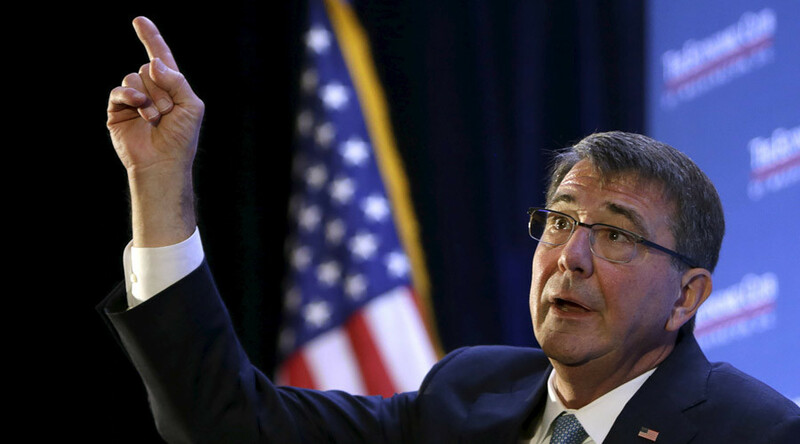 A semi-secret Pentagon plan to convert old war planes into “flying launchpads” or “arsenal planes” to aid stealthier, less weapons-capable planes was mentioned by Defense Secretary Ash Carter in a speech outlining a $583 billion military budget for 2017. Speaking to the non-profit Economic Club of Washington on February 2, Secretary Carter brought up the little-known Strategic Capabilities Office, something “we don’t often talk about,” he said. One of the projects Carter wants realized quickly is the “arsenal plane,” which he described to the group, albeit with few details. Though Carter avoids naming which aircraft would serve what role, an “arsenal plane” would certainly benefit F-22 and F-35 stealth fighters, which are limited to carrying bombs internally since external arms ruin their stealth capabilities. The F-22 is capable of carrying just two air-to-air missiles and from two to eight bombs, depending on the type. The F-35, a notoriously over-budget and under-performing plane, can only handle two bombs and two air-to-air missiles due to its unfinished software system. At about $90 million a pop, the F-35 amounts to one of the most expensive defense programs, totaling about $1 trillion for nearly 2,500 planes with an additional $650 billion required for upkeep, according to the Government Accountability Office. Legislative attempts to cut spending and do away with much of the F-35 program have failed, leading to further spending to try to fix the budget boondoggle’s defects. One likely contender for the arsenal plane is the B-52, a bomber first introduced in 1955, which can carry a weapons payload of up to 70,000 pounds (31,750 kilograms). Another is the B-1 bomber, which debuted in 1986 and is able to reach supersonic speeds, meaning it is relatively well-suited to accompany F-22s and F-35s. Other possibilities include cargo planes such as the C-130 Hercules and the superior C-17 Globemaster. A similar “arsenal ship” program was sought by the Navy in the 1990s, but ultimately was deemed too expensive to complete.